It does not happen very often, but sometimes…..
One goes somewhere to take some pictures, and when returning home one remembers something that might have been interesting, but one forgot to take a picture of it. It is getting even worse, when that day there had been 4 photo sessions, and one does not remember in which place these pictures should have been taken. After having visited 4 different churches in the Brionnais I remembered some promising heaps of stones on a piece of grass just outside a church, which I wanted to explore further. I forgot to do so, as well as I had forgotten the name of the place the church was in. During a next visit to the Brionnais we were close to 3 of the 4 places we had visited previously, and they were certainly not that place. 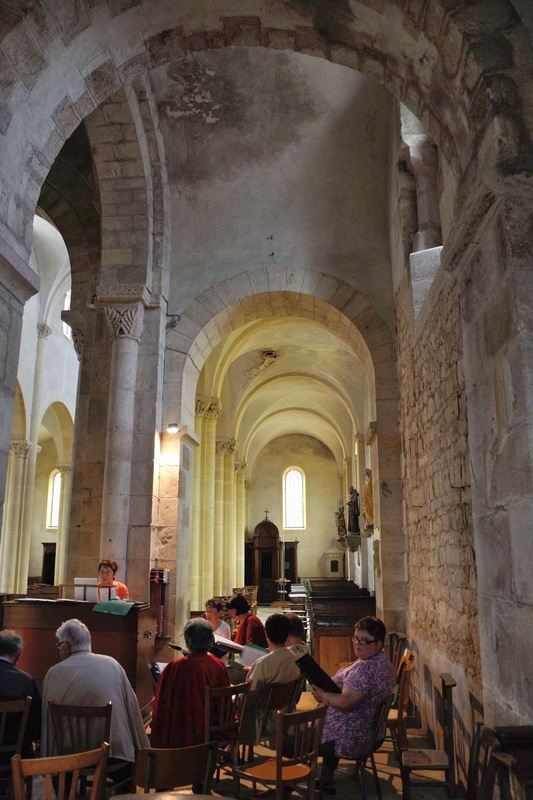 Elimination gave us the name of the place we were looking for: Saint-Laurent-en-Brionnais. Google Maps could have helped us more quickly; it was the only church out of those 4 with a piece of grass next to it! Well, I certainly did not go back for this! A third visit solved my problem, and brought two surprises. The first (unpleasant) surprise was that the stones were hardly worth photographing. The second surprise however was a pleasant one. During our first visit there was a choir rehearsal going on. Even though the choir was of an abominable quality I considered it to be rude and impolite to march through the church, investigating every stone, using flash, etc. in short, to disturb them. Hence I did not use flash, avoided the part of the church they were using, and kept well out of their way. The whole session resulting in very few pictures of mediocre quality. During this second visit the choir was, thank heavens, nowhere to be seen, which gave me the opportunity to wander around at my own leisure. And it turned out that I had missed out on quite some interesting things during that first visit. 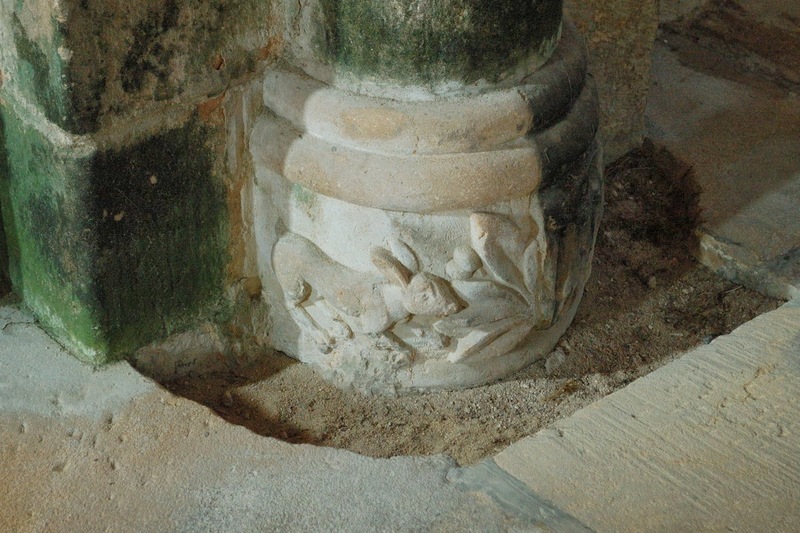 Not only does the church have a number of very interesting capitals, but a number of columns possesses also interestingly sculpted column bases; there were snakes, a rabbit, some crowned heads, etc. Which proves, that it sometimes pays off to return to the scene of the crime! For my album of Saint-Laurent, click here. 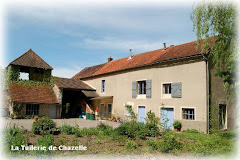 The Brionnais, and not just Saint-Laurent, is more than wort a daytrip from La Tuilerie de Chazelle. When I started to get deeper into the subject of Romanesque architecture, every so often I stumbled upon some Latin phrases. And since I do not have a classical background in that sense I had to resort to looking things up in for example Wikipedia. When I came across the term “opus spicatum” in the glossary of terms used in Romanesque architecture, I decided to see what Wikipedia had to say for itself. The Dutch as well as the English Wikipedia refer to a way of arranging stones or bricks, a so called bond, and the translation that was given was “herringbone pattern”. However, the English Wikipedia also gave as a literal translation “spiked work”, based on the Latin word for spike, ear or head which is spica. The French Wikipedia refers to the same thing, and translates the term literally as “appareil en épi de blé”, which is “ears of wheat pattern”. However, the French Wikipedia mentions that this “appareil” is often mistaken for “appareil en arête-de-poisson”, hence “fish or herringbone pattern”. This last definition links straight to an entry of the same name, which at the time also refered to the Latin name “opus piscatum”. the link to the Latin word for fish seemed plausible at the time. However, in view of this blog I decided to reproduce the search I described earlier. Neither the Dutch nor the English Wikipedia gave any surprises; the French however did. The French entry was last updated January 2014, and the last remark in this entry states, that even though the term “opus piscatum” can be found in several recent publications, it is not a proper architectural term. This term is a neologism, and there appears to be no Latin adjective “piscatus”. However, the French still maintain two separate entries in their Wikipedia; both entries distinguish “appareil en arête-de-poisson”, where the fish bones at angles meet at a straight line, whilst in the ears of wheat pattern the ears meet forming a zigzag line. That was my first encounter with “opera” (plural of “opus”) in architecture. The French Wikipedia gives under the heading of “appareil” an impressive list of the various “opera” or bonds in use by the Romans in their architecture. 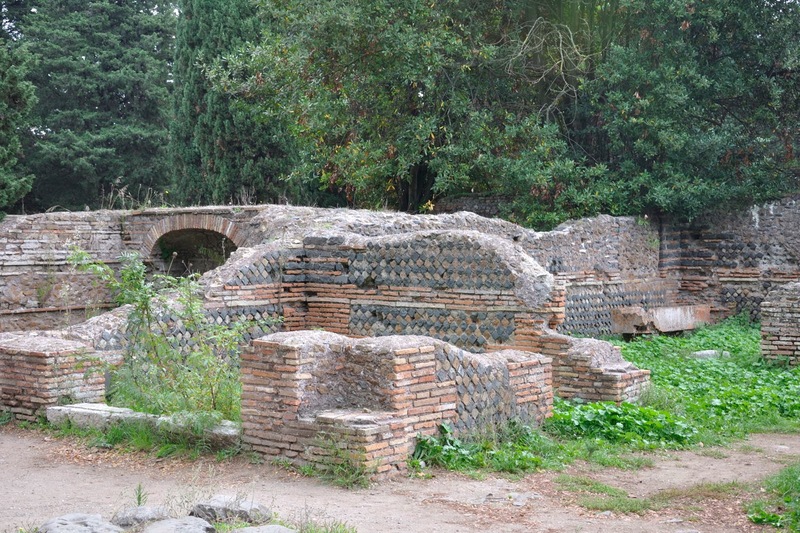 And indeed, when I visited the old Roman harbour Ostia Antica during a vacation in Rome I read on a number of information panels descriptions of the various opera to be found on certain walls. One of these walls was built using “opus quasi reticulatum”, described on the panel as a bond formed by small tuff pyramids, placed at 45 degrees. This description did not exactly give me an aha-experience, but when I looked at the wall I saw what the writer had meant. Wikipedia gives for “opus reticulatum” stones arranged in a fishing net pattern, and the “quasi” is added when the pattern is not very regular. One could also call it a diamond pattern. 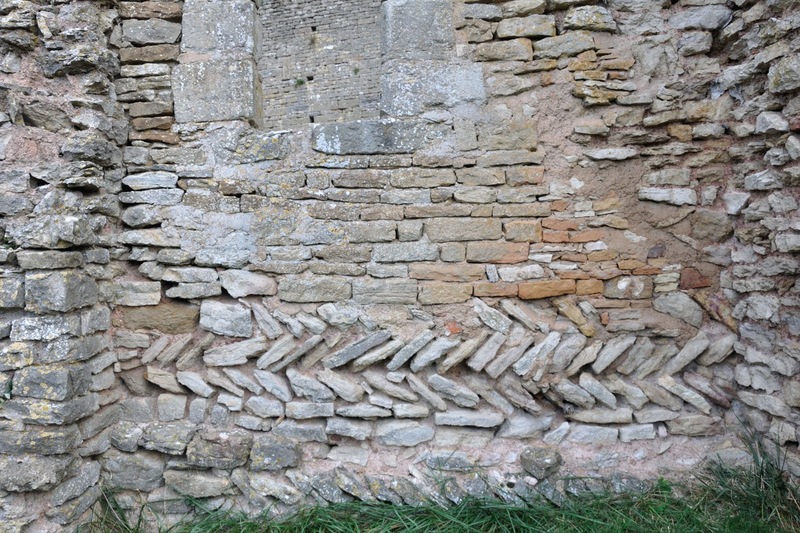 By this time I thought I had seen it all: herringbone patterns are not exactly rare in very old buildings in this part of France, ears of wheat patterns are often found in decorative road pavements, and the net or diamond pattern I had never encountered outside Rome. It was quite a surprise when I found this pattern while visiting my brother in Bergum, a small town in Friesland, a northern province of the Netherlands. The church wall of the local Romanesque church not only had some decorative panels in ears of wheat pattern, but also some panels in a diamond pattern! 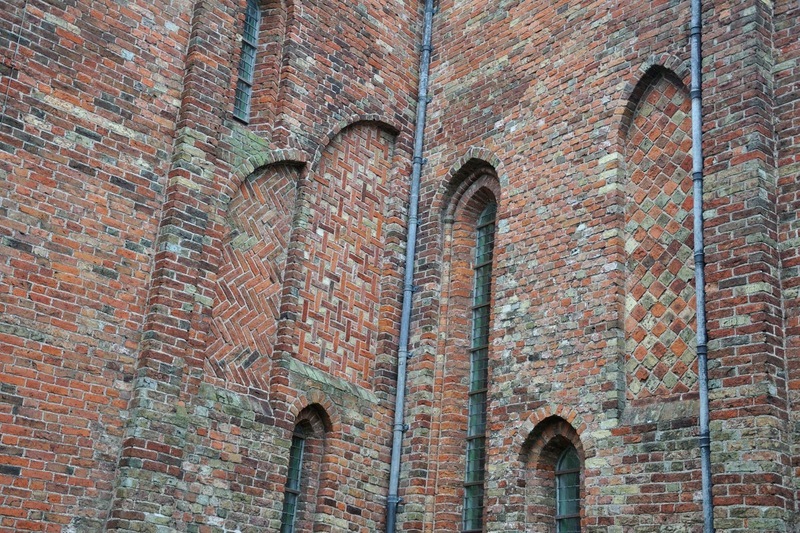 And on top of that, the church was partially built using tuff. As can be deduced from the above story, believing Wikipedia blindly is not always a good idea, and one has to be even more careful when the origin of words is explained without any proper knowledge of etymology, or when culture-historical conclusions are drawn based on “ logic” instead of based on historical knowledge. Hence I would not dare to say that the decorations on this church are based on Roman architecture, however, it is not impossible. There must have been quite a bit of cultural cross-pollination after the Christianization of Europe; think of the Lombard builders who flocked from Italy all over Europe and left their traces everywhere, and certainly in France. It is not unlikely that these people had some knowledge of Roman architecture, and it is also not unlikely that these Lombards (or their pupils) did not wander further north than just France. 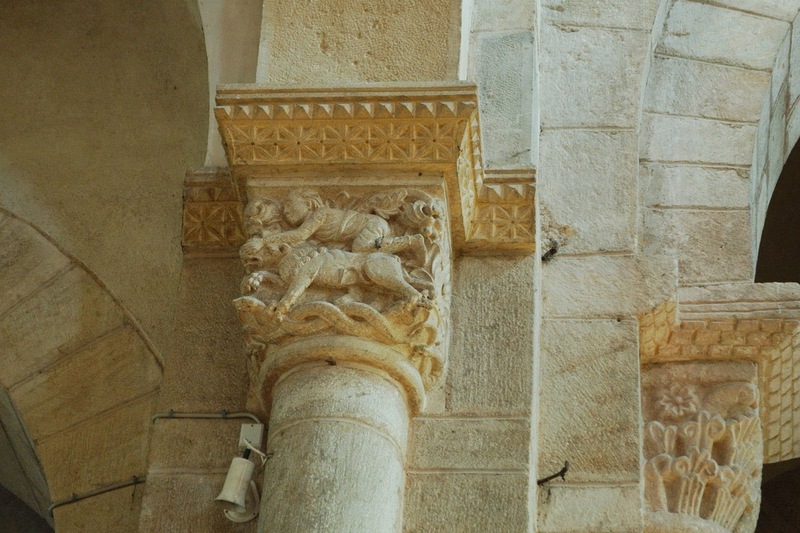 Anyway, I will soon force myself to change the entry “opus piscatum” in my glossary of Romanesque architecture according to my recently acquired knowledge. 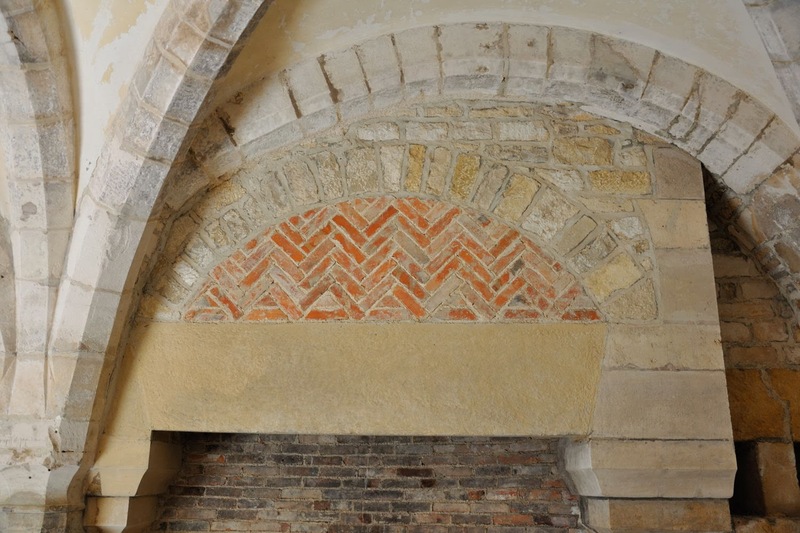 There are sufficient herringbone patterns from the Romanesque and pre-Romanesque period to be found within a radius of 12 miles around La Tuilerie de Chazelle.